Welcome to the May edition of “Liturgy Notes”, the liturgy and music section of the Faith & Life E-Newsletter. 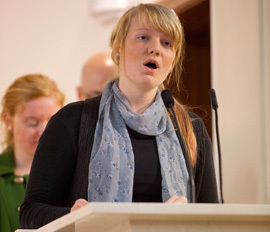 This month contains an update on the upcoming music workshops, a review of the Ascension seasonal psalm, as well as our regular section on recommended music selections for upcoming Sunday Masses. It also contains two recommended liturgies for the launch of the Year of Grace. Next month will feature information on the upcoming regional celebrations instituting acolytes and commissioning extraordinary ministers of Holy Communion. Regional training and formation days for Readers will be held in August and there will be formation and training for sacristans and ministers of hospitality in September. Look for further details in next month’s Liturgy Notes. The parishioner agreed and worked with other parishioners to provide food for the shelter. I find three important points in this true story. Firstly, the parishioner felt they had nothing to offer. We often hear this mentality expressed as “I’m not good enough” or “I couldn’t do what you do.” However, the reality is that God has blessed every one of us abundantly with many gifts. We have natural talents and hobbies, our personality and spirituality, skills used at work and home, and the gifts of the Holy Spirit. We seem to easily share these gifts with others without even being asked. Secondly, the parish priest and parish considered ways to embrace these abundant gifts, beginning with the gift, rather than a need. This means starting with the person, their passion and what gives them life and energy. Baptism, which makes us sharers in the Church’s mission, calls us to share our gifts. So rather than contributing through ways we are not gifted, it is important to cultivate and share our already present God-given gifts. Thirdly, the ministry grew because there was great joy in what was being shared. The priest and parish didn’t need the cooking to be done. Nevertheless, they unlocked a gift already present within the parishioner. Likewise, the parishioner did not feel obligated to share their gift, because it came out of a deep love for what they were doing. Easter is the great celebration of our Baptism. Our Baptism plunges us into the reality that we are children of God who are empowered to use the gifts graciously bestowed upon us. Just like the parishioner, we need to be true to our individual uniqueness, not someone else’s. Baptism challenges us to recognise our calling and follow Jesus every day with the help of the Spirit. Far from being secondary to our human gifts, our Baptism directs the gifts God has already bestowed upon us. St Irenaeus says “the glory of God is the human person fully alive.” We are human first, and then, through Baptism, we are graced and invited by God to use these gifts and the gifts of the Spirit for the growth of God’s reign. By understanding our true gifts and the generosity of God, we are empowered to realise the fullness of life that God invites us to share. In this edition of Faith and Life, you will find many examples of people living out this Baptismal invitation to share gifts with one another and the wider community, out of a deep love for what they do and for those around them. The word is out! 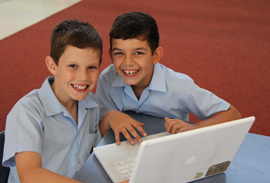 Hundreds of young students in Catholic Primary Schools are joining Mini Vinnies! Mini Vinnies is the name given to a group of primary school students who get together to help those in need within their school and the local community. Mini Vinnies introduces students to social justice issues, to the St Vincent de Paul Society and to living faith through action. Being a Mini Vinnies member is being part of the wider St Vincent de Paul Society family and our Good Works. 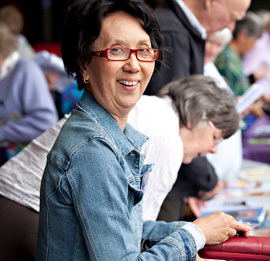 The St Vincent de Paul Society assisted over 95,000 people across the Wollongong Diocese last year. Our core work is carried out by committed volunteers and members. Every day they meet with people experiencing situations of hardship. With listening hearts members go to great lengths to walk with people through their journey of suffering and pain. It takes a very special person to see Christ in the poor. Throughout the month of May the St Vincent de Paul Society will be seeking special people who can share their gifts of grace with the people we serve. 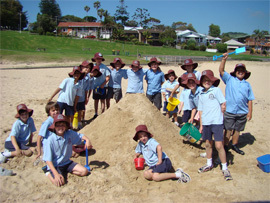 Across the Wollongong Diocese over 500 primary school children are making a difference and have committed themselves to service of others, with more joining everyday. Come and join the Vinnies family, visit our website www.vinnies.org.au or contact Jeannine Ashton at youth@svdpwgong.org.au or phone on (02) 4627 9013. The English writer C. S. Lewis described his conversion to Christianity as being “surprised by joy.” Lewis had a very particular understanding of joy, which he carefully distinguished from both happiness and pleasure. Joy comes with the satisfaction of our deepest desires. Joy is what we long for always and rarely find. It is the experience of genuine unity and harmony with the world around us. It is the intimate connection with a person that makes us feel whole and complete as human beings. The history of Christianity can be said to begin with joy — the greeting of the angel to the shepherds, “Do not be afraid; for behold I proclaim to you news of great joy.” (Lk 2:10) And, of course, the most profound experience of joy is found in the Easter mystery — Jesus’ victory over sin and death in the Resurrection. Here the disciples on the road to Emmaus, and in Jerusalem and Galilee, encounter the Risen Lord and find their deepest longings fulfilled and their hearts burning within them…. Why, then, are so many of us Christians still lost? Why is there so much bitterness and anxiety among us? Why do we still feel desperate and afraid? Why do we bicker and quarrel among ourselves? Have we forgotten the hope we received at Christmas? Have we lost all sense of Easter joy? The fear and anxiety we Christians feel today stems from a lack of faith. Like the disciples, we fail to comprehend how God works in our world — bringing light into our darkness and healing into our brokenness. And we fail to listen for the “stronger voice of faith” among all the negative messages of doubt and despair in our world today. Christians in the 21st century (as in every age) have been given the gift of joy. We have experienced, in a provisional way, what it means to be fully satisfied, to know lasting peace and to find true love. We are called to be stewards of the joy we have received in Christ — to nurture and develop it and to share it generously with others. 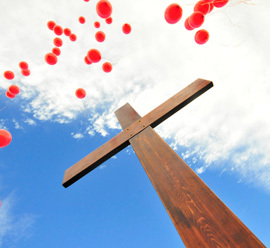 During this Easter season, let’s be joyful stewards of the gift of faith. Let’s celebrate the Lord’s resurrection by being grateful, generous and responsible stewards of the Mystery of God’s love, which has saved us and set us free – now and always and forever. Amen. Adapted from Stewards of Joy: Taking Care of and Sharing the Gift of Faith, by Dan Conway. St. Catherine of Siena Press. Sourced from: The Good Steward Newsletter, April 2007, used with permission. Catholic Schools Week (CSW), 29 April – 5 May, is a wonderful celebration of Catholic Education involving all our Catholic parish primary and secondary schools throughout the Diocese. This years’ theme is Faith in Every Student. The theme recognises both the faith that each school community has in its young people as future leaders and citizens as well as the faith instilled in each student through their education and formation. During CSW our schools celebrate with special assemblies, Masses, liturgies and prayer to mark the occasion. So what does ‘Faith in Action’ look like in our Catholic schools? The numbers of students and staff in our Catholic schools actively involved in Social Justice and Outreach initiatives is increasing. Many of these initiatives are conceived and instigated by the students themselves under the guidance of experienced and supportive teachers. Projects range from assisting Caritas Australia, especially through Project Compassion, with organised fundraisers, events and activities through to working on the Vinnies Van team on a chilly Friday night. The unique charism of each school is strengthened by that school community giving visible and active support to ministries and good works beyond the school closely connected or with special meaning for that school community. A good example is the awareness raising and fundraising activities that a significant number of schools have established in support of the people of Kiribati. These school communities are connected with religious congregations working in Kiribati. Some schools have given interested students the opportunity to travel to Kiribati to experience first-hand the situation for the people in this country with limited resources in the face of significant physical and economic challenges. Other schools have set up experiences for students to visit remote indigenous communities or ‘see’ and support the marginalised and poor in their own local communities. Student Immersion programs such as these are increasingly being used as a way for students to ‘step out of their own shoes’ and into those of another, to see the world with different eyes and more importantly to respond as part of the wider community of God’s people. Catholic schools are also vibrant places of faith formation and development. Opportunities such as student retreats, youth camps, reflection days and spirituality programs are popular, but profound and enriching ways for our children to engage in deep conversation about their faith and encounter their God in new ways that fall outside the routine of the normal school day. The theme of Faith in Every Student is certainly most fitting because our Catholic schools are indeed vibrant places of Learning and Faith in action and the young people in our schools are certainly being instilled with a faith that further strengthens their sense of belonging and of being united with one another. It is here in practice where Catholic schools are being authentic to their purpose as they engage in mission as an important part of Church in our Diocese. For further information about Catholic Schools Week please contact your local Catholic School or phone Tim Gilmour at the CEO Wollongong on (02) 4253 0938. Stan: Coffee and Vegemite on toast. Teresa: espresso coffee with a bowl of cereal. What inspired you to become foster carers? We have always wanted to become parents but were unable to. So we thought that we could help the children that couldn’t live with their own parents. What have been your biggest challenges as foster carers? Having to surrender a much loved foster child to other carers or family knowing that you may never see them again. What has brought you the greatest joy as foster carers? The children. No matter how many dirty nappies we change or how many sleepless nights we may suffer, seeing them transformed into a confident, happy toddler or child makes it all worthwhile. What advice would you give to someone who was thinking of becoming a foster carer? I have been often told by people that they would become foster carers but they could not bear to give the child back. I always tell them that I love the children as my own and it is not easy for me to give them up either. In fact it takes a lot out of me and I grieve the loss. I then ask them a question. Imagine that you were walking down the road and you saw a baby or small child lying in the middle of the road and all around people were walking past and no one stopped. What would you do? They always answer that they would stop to help. I then tell them that this is all we are doing. We cannot afford to stop and think what it will cost us later; we must act now or the child will be lost. John Paul II, Mother Teresa of Calcutta and our parents. In what ways does your faith play a role in your ministry as foster carers? If we did not have faith we would not be able to give up the children and move on to help the next one. Each child deserves to be loved and to feel special. We could not love and treat each child as they deserve if we were grieving for the last one. We place our trust and our foster children in the care of our dear Lord. In 25 words or less, what hope do you believe the Church offers the world today? I was once told that we, the people, are the Church. We need to live the Gospel, not just listen to it on Sunday. We need to be the hand of Christ in order to lift the fallen; to be his eyes in order to see injustice and to be his voice in order to bring all wrongdoing into the light. National Sorry Day and National Reconciliation Week occur at the end of this month. They are important times for commemoration, recognition and action. In our Diocese we celebrate the gift of a number of Indigenous and Aboriginal Communities. National Sorry Day, 26 May, is an Australia-wide observance held on 26 May each year. This day gives people the chance to come together and share the steps towards healing for the Stolen Generations, their families and communities. Stolen generations refer to Indigenous Australians who were forcibly removed from their families and communities. National Reconciliation Week, 27 May – 3 June, is celebrated throughout Australia each year to commemorate two significant milestones in the reconciliation journey – the anniversaries of the 1967 referendum and the High Court Mabo decision. The week is a time for all Australians to learn about our shared histories, cultures and achievements and to explore how each of us can join the national reconciliation effort. There are many gifts and talents! Begin by appreciating the scope of gifts and talents in our world. A gift or talent, simply put, is having a natural God-given ability for something. Easy gifts to identify are those displayed by artists and performers but there is a tremendous variety of gifts. Examples of other gifts include being a people person, good at numbers, someone who listens. Here is a sample gift inventory. Now, consider yourself. Many people find it hard to accept they are gifted. It can sound like we are conceited or skiting. Sadly, we may also think we have nothing to offer. Yet both responses do not honour our God whom has bestowed gifts upon us. We are formed in God’s likeness, we are wonderfully and fearfully made (Psalm 139:14). God calls us to act in the world and equips us for our mission. Pray with God that you may be open to what God offers. Prayerfully reflect on what you do well. To help you, here is a sample gift inventory or start to consider in a broad sense what comes naturally to you. What do people compliment you on? What can you do easily which others find hard or frustrating? Make a list. Keep adding to it! Share this list with a couple of others, a close friend or family member. Do they agree with this list? What other gifts do they see in you? Spend time with God in prayer, thanking God for the gifts in your life. How do you share your gifts currently? Are you using them well? Are you sharing them with others? Start to think how you might apply your gifts at home, with your family, at your work, in the community, in your parish. Before taking on a role with your gifts, consider your life balance. Do you need to stop doing something in order to take up a new role? Also, ensure whoever is employing your gifts is offering appropriate support. A good use of your gifts will see them grow. You will become stronger in your area of giftedness. Look for opportunities to enrich your gifts. Affirm others in their gifts. If possible, nurture others to develop their gifts. If you are employing your gifts well, and affirming others, hopefully they can become confident enough to take on a role which you are doing. This can be a time of new discovery as you move on to explore what else God may be calling you to. Do you know someone that would like to subscribe to this E-Newsletter? If so, just forward the E-Newsletter to them and ask that they enter their details below to subscribe. It takes less than 30 seconds!